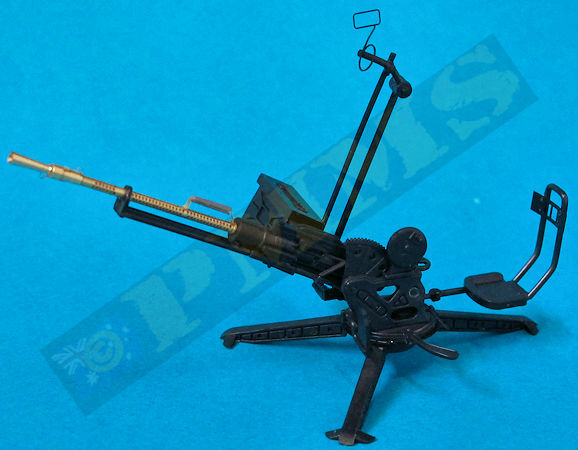 The KPV-14.5 heavy machine gun was introduced in 1949 as an Infantry support weapon but withdrawn in 1960 due to the heavy weight, it was then developed for the ZPU series of anti-aircraft guns, notably the ZPU-1, ZPU-2 and ZPU-4, a version was also designed with a shorter receiver for use in vehicles such as the BRDM-2 and BTR-60 and BTR-70 heavy APCs. 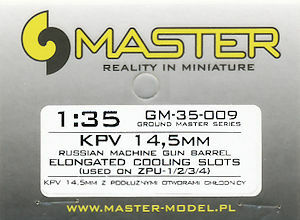 The 14.5x114mm M41 cartridge comes as High Explosive Incendiary-Tracer (HEI-T) or Armour-Piercing Incendiary (API) rounds and has approximately twice the energy of a 12.7 mm MG projectile making it very useful against lightly armoured vehicles, low flying aircraft especially helicopters and larger structures such as bunkers. The KPV is air-cooled and fitted with quick-changabe barrels. 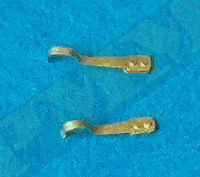 Both these new barrel update sets GM-35-009 and GM-35-010 are the same apart from 009 having the Elongated cooling jacket holes and 010 having the Round cooling jacket holes, therefore all comments below relate to both sets equally. The quality of the machining on the barrel/flash suppressor and cooling jacket is first class without any residue or other blemishes to clean up prior to assembly, the etched parts are equally well done as are the two resin lifting handle pads. 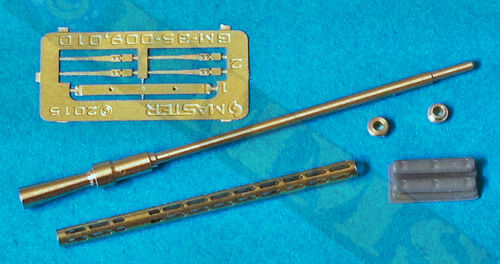 Removing the etched parts from the frets requires care due to the small size and you are given four of the small barrel tip brackets (only two required on the barrel) as these are extremely fine and due to the bending required easy to damage or lose and having a couple of spares is a very useful inclusion. 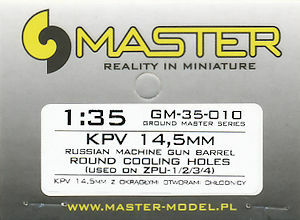 The same goes for the very small round grommet fitted to the receiver end of the cooling jacket, these are very small and slippery due to their small size/shape and again having a spare is a very thoughtful inclusion by Model-Master. Clean-up of the resin handle pads needs some care as you must get the inside surface perfectly smooth for a good sit on the resin handle frame and using a very sharp blade to remove from the backing block and carefully trim the attachment pins is best. Dimensionally these match available data well (length etc.) although I don’t have any 1:35 plans to verify this, they also match visually dimension wise when comparing to the many photographs available as well as offering a substantial leap in detail definition compared to the plastic barrels in the available kits. Assembly is fairly straightforward if a little fiddly due to the small etched brackets and the resin hand grips on the barrel but with care there shouldn't be any problems and as mentioned you get a couple of spares should you lose one of the smaller parts. It’s best to first separate and clean up the etched and resin parts before commencing assembly as this will save time along the way. 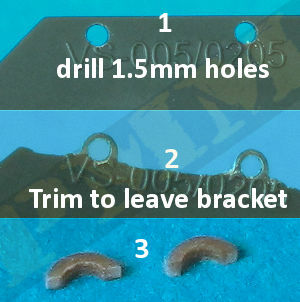 (1) The small etched brackets (PE2) have end tabs that folds over onto itself and small curves added to the end of the brackets; I simply laid the bracket of a small drill bit and used the tips of fine tweezers to bend the bracket around the bit to form the curve. The grab handle frame has engraved bend lines so bending this shouldn’t pose any problems. You should bend the frame before fitting the resin handles as this makes it easier to position these correctly on the frame. to the handle frames ensuring the correct alignment. (2) Fit the small round grommet to the end of the cooling jacket and then slip the barrel tube through the cooling jacket and glue the front on the jacket with a small dab of CA to the barrel just behind the flash suppressor, all very easy. Note if the cooing jacket doesn’t slip over the barrel easily just shave the smallest bevel of the inside of the cooling jacket with a sharp #11 blade as the tolerances are very fine and just bevelling out the edge may help it fit into place, we are talking very small amounts here and a single pass of the blade around the end was sufficient for one jacket that caught the lip of the barrel. and the notches between them top and bottom. The rear lifting handle is then glued in place (with CA) ensuring this aligns with the front brackets. (4) Image of assembled Elongated Cooling Holes barrel ready for fitting to the desired kit gun. 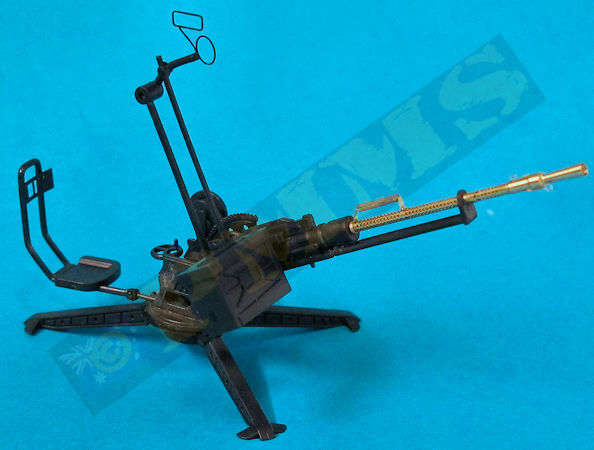 The KPV 14.5mm Heavy Machine Gun was used for the AA mounts ZPU-1/2/4 and at present there are only two kits available of the ZPU-1 and just one of the ZPU-2 but none for the ZPU-4 which is a shame as these have been widely used in conflicts such as the Korean and Vietnam Wars and just about every local punch up in the Middle East and Africa for the last 50 odd years. Only two ZPU-1 kits are available at present, one from Meng Models (kit VS-001) bundled with the Toyota Hilux so not a standalone kit and one from a company Russian Project (kit 35001), a kit I know nothing about so can’t make any comments. The Meng ZPU-1 was covered in a full review of kit VS-001 here so will just give a quick rundown on fitting the MM barrels. 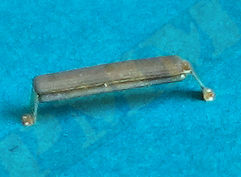 As noted in the review the Meng 14.5mm barrels are about 10mm too long and so replacing this with the metal barrel will improve things considerably. With the metal barrel assembled as above, firstly just cut the kit barrel from the front of the receiver and drill a 0.8mm hole for the metal barrel pin. Half way down the barrel is the support bracket ring and cut the barrel flush with one side of the bracket and then drill (carefully) a 1.5mm hole in the middle of the bracket and fit the around the metal barrel. With the support ring separated from the kit barrel I just cut one side and slipped this over the cooling jacket and then re-glued the bracket ring. 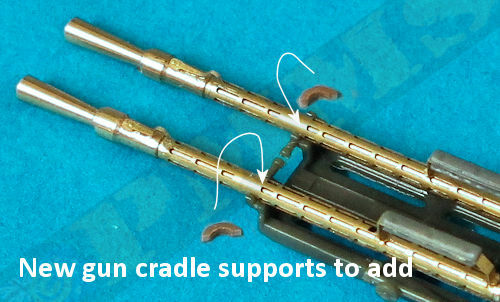 There is also the lower twin support rods that mate to the bracket and you need to shorten these by 10mm and simply re-glue to the support bracket on the barrel and you are done, the remainer of the gun can be assembled as per the kit instructions. 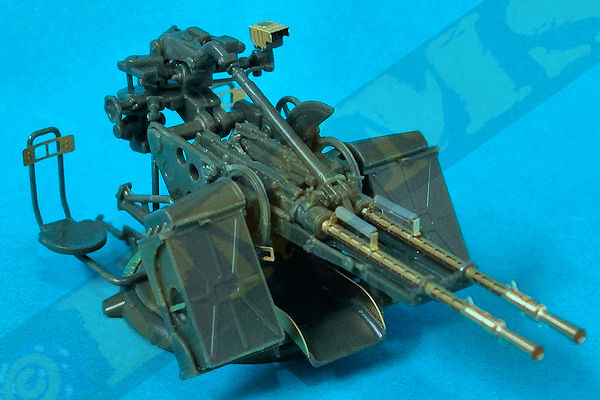 Images of the fully assembled Meng ZPU-1 AA gun from kit VS-001 with the Model-Master KPV barrels fitted. The only ZPU-2 kit available is again from Meng Models (kit VS-005) bundled with the Toyota Land Cruiser single cab and so is also not a standalone kit. 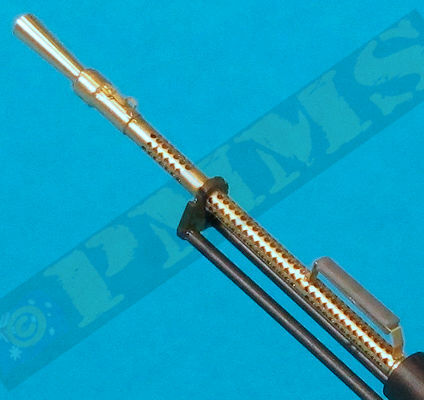 The ZPU-2 in this kit is the later production type and builds into a very nice kit in its own right and the guide below is on fitting the MM KPV barrel to this kit. > (1) Cut away the plastic barrel and drill 0.8mm hole in the receiver. 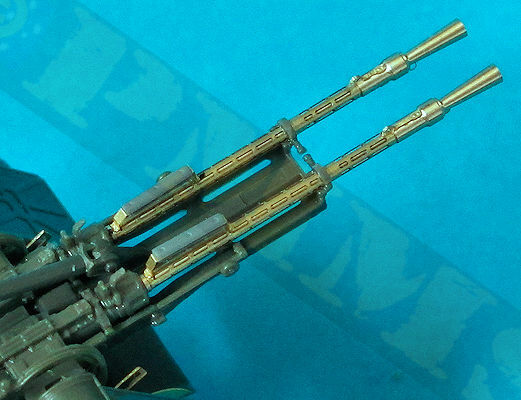 (2) Fit the MM barrel ensuring it aligns correctly vertically. (3) There are two small brackets that hold the barrels into the end of the cradle and these are moulded as part of the kit barrels, with these removed you will need to add them back onto the metal barrels. It is quite difficult trimming these from the kit barrels as well as they are slightly too small for the metal cooling jackets due to the couple of mm difference in diameter and it’s easier to make news ones. still attached to the kit barrel and new ones will need to made to fit over the metal barrels. This is due to the diameter of the kit cooling jacket being 1.3mm and the metal cooling jacket being 1.5mm. To do this I used the large flat tabs on corner of the sprue and first drilled 1.5mm holes the width of the bracket from the edge, then with a sharp #11 blade trimmed away the plastic until the thin bracket was done (4). This can then be cut away to make the newer larger brackets that are simply glued into place over the barrels on to the cradle attachments. That done the remainder of the kit can be assembled as per instructions. 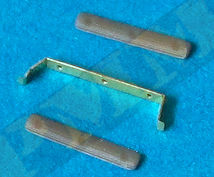 leaving two brackets (2), finally just cut away the bracket as indicated (3) and fit the kit to complete the assembly. 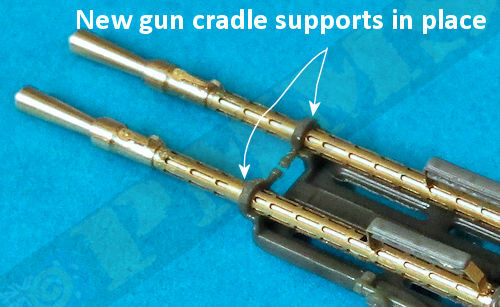 Images of the new brackets in place and the fully assembled guns in gun cradle. 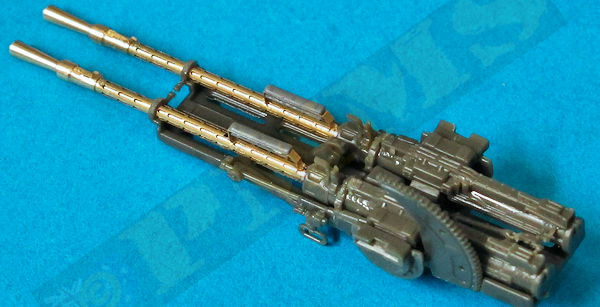 Images of the fully assembled Meng ZPU-2 AA gun that comes in kit VS-005 with the Model-Master KPV barrels fitted. 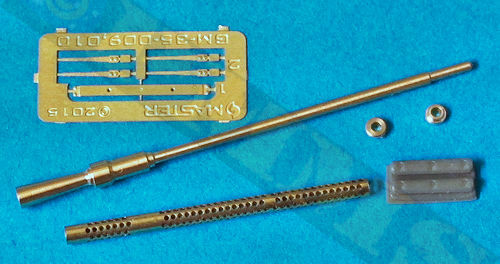 These are exceptional produced barrels with clean machining of the metal parts, as well as the etched and resin details, basically straightforward assembly although you do need to take care with the smaller parts, the most work is in fact fitting them to the respective kits due to the securing brackets midway along the barrels, but again this is not overly difficult for moderately experienced modellers. The barrels themselves are very well done and improve the appearance of the few kits available to take them immeasurably and are well worth the moderate investment. Thanks to and my aching back account for the review sets.